Gold price bounced back and finished the week strong during the last week of July; silver price, on the other hand, finished the week below the price level it had started the week at; both precious metals’ prices finished the last day of the month rising; this might be related, in part to the disappointing GDP growth rate of US in the second quarter that reached only 1.3%. All in the all, gold and silver prices had a huge rally during July, as they have broken the stagnations they were at in the past couple of months. Gold price moderately inclined by 1.04% during the week; furthermore, last week’s average gold price reached $1,619 /t. oz which was 1.37% above the previous week’s average price of $1,597 /t. oz. Gold price finished the week high at $1,631 /t. oz. Silver price on the other hand moderately declined by 0.63% from beginning to end, but this week’s average price was $40.31/t oz or 1.17% above the previous week’s average $39.84/t oz. During the week, the average daily percent change of gold price rose by 0.37%; silver price didn’t change on an average daily scale. 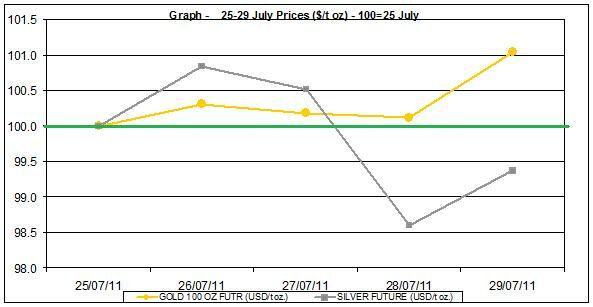 In the chart below are the silver and gold prices that were normalized to 100 to the price at the beginning of the week – July 25th. It shows the trend of these precious metals prices. In the chart above gold price didn’t change much during the week, but had a clear upward trend during last week. Silver price fluctuated during the week and started the week strong, but by Thursday it sharply declined; it finished the week below its initial price level at the beginning of the week. 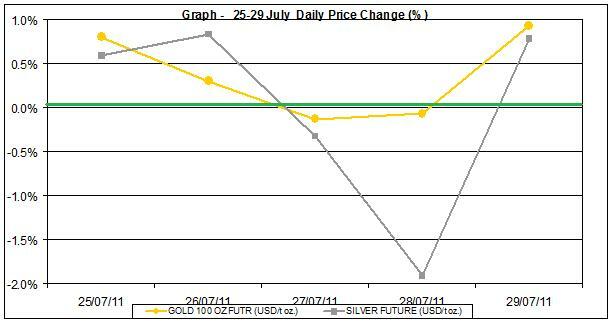 The last chart is of the daily percent changes of silver and gold prices during last week (i.e. the changes around the trend). The chart shows that gold price didn’t change much, mainly during the middle of the week, but at the beginning and the end of the week it inclined. Silver price started the week with moderate rises, later shifted to a sharp fall and bounced back by the end of the week. What is the distribution of gold prices?